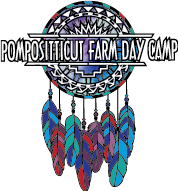 Pompositticut Farm Day Camp is a co-ed camp for children ages 4-15. Situated on a picturesque farm, PFDC Inc. offers Red Cross Swimming Lessons, English Horseback Riding, Nature Activities, Archery, Sports, Creative Arts, Ropes Adventure Course “Project Soar”, and Theater,-Dance -Music. This summer there are positions available in all areas. Each Head Instructor is responsible for planning the daily activities and set-up for each lesson. This Instructor will conduct 45-minute classes aided by a Co-Instructor. Some specialized activities will require a second assistant and/or teen, Jr. Leader. Each camper group will contain up to 12 children of approximately the same age, with all groups having teen Jr. Leaders assigned for additional assistance. All staff will be responsible for attending pre-camp orientation and training. If our pre-camp training dates conflict with your school commitments, alternative arrangements may be made. However, all staff must complete a minimum of 21 hrs. of pre-camp training prior to commencing any session working with campers. The work week is Monday – Friday, 8:00 – 3:45 (38.75 hrs), paid bi-weekly throughout your employment. Qualifications for Professional Level applicants should be college graduates, schoolteachers, phys.ed teachers, coaches or other licensed or certified persons with at least three years experience in their field. Head Instructors must be a minimum of 18 years old and Co-Instructors must be a minimum of 17 years old. PFDC seeks to employ people for full sessions during the camp season. Please keep the following dates in mind as you apply. Below are the seasonal job descriptions. If you have any questions, please call the camp office at 978-562-0968. Pompositticut Farm Day Camp Inc. provides its campers 7 daily activities. Each activity has different “teams” of staff. At PFDC Inc. your title is given to you in accordance with your experience and background for pay determination only. We are all considered a part of a “team”. Minimum age requirement is 21 years old, with 4 years work experience at PFDC Inc. or some other child care or camp facility. The Assistant Director executes the program set by the director. He/she will be responsible for overseeing the daily operations of all the camp activities. This person is the direct liaison between the campers, staff, parents and the Director. He/she is the head of the staff hierarchy. He/she must be a decision-maker, a peacemaker, and a role model to both the staff and the campers. Even though your age may be close to your co-workers, you must be capable of giving direction and assistance in the instruction of the different activities. He/she must be a determined, focused individual who recognizes the importance of the responsibility. The duties of this person are, “Whatever it takes!” The applicant must be a versatile person who could teach any of the seven activities should the situation arise that the instructor could not fulfill his/her duties. CPR and Standard First Aid are preferred. Please attach a photocopy of any certifications with your current application for employment. A resume is also suggested. Pay will be based on experience. Although the state only requires the Health Care Administrator to have a minimum of CPR and American Red Cross Standard First Aid certification, Pompositticut has higher standards for its medical staff, since our goal is to accommodate all children. EMTs, NPs, PAs or RNs are a preferred candidate to maintain the health and safety of our entire population of campers, teens and staff. He/she should be knowledgeable and/or have had experience in the medical field. The position would include the maintenance and dispensing of over-the-counter and prescription medications. Daily health logs and medical disbursements must be maintained as well as communication with parents of a camper with complaints, illnesses or injuries. The Health Care Administrator must also be prepared to handle the emotional well being of the campers, parents and staff in such situations as separation anxiety and peer pressure, as well as an emergency at our high risk activities. For the 13, 14 and 15 year olds, PFDC Inc. has a “Junior Leader” program. During the teen years, these individuals are exposed to more of the daily operations of camp, but now from a staff’s point of view. Most of these young adults are our group leaders, who assist the camper groups to each of their activities. During the course of their commitment, their major concentration will focus on becoming a role model and making the transition between being a camper and a staff member. This program director needs to assist in teaching and demonstrating mature leadership skills, appropriate language and behavior, organizational skills and helping to develop a group identity with the teens they will be overseeing. The minimum age requirement for this position is 19, with a minimum of Red Cross certification in Life Guarding, First Responder, CPR and First Aid. For the entire 8 weeks of camp, the director will be in charge of numerous responsibilities for the after camp program (Fun Club) held at the pool area. Hours are 2:30pm – 6:15pm, Monday – Friday, with the exception of the last 4 Fridays off during each session. Included in the daily duties are scheduling the required number of staff, organizing and planning activities, maintaining accurate accounting and preparing afternoon homemade snacks. The coordinator of this program will be responsible only for children ages 4-6 who participate in our 7 daily activities. Although you will be assisted by other activity heads, you will be responsible for designing and planning projects for each activity, including a closing ceremony performance, for each of the four sessions. Minimum age is 20, with at least 2 years of college level coursework in Early Child Development and/or relevant work experience. Necessary personal attributes include patience, creativity, a sense of humor, the ability to be flexible and spontaneous, and the energy and enthusiasm to motivate and captivate this young group of campers, for many of whom this will be their first structured group experience. The coordinator must be stridently safety conscious, especially during the activities of Horseback Riding and Swimming. Knowledge of child development stages is imperative to develop and oversee the curriculum for the 12 children in this specific group. Project Soar is a carefully designed challenge course created from poles, ropes, tires, ladders and boards which encourage games for the mind and not necessarily the athlete. Each highly qualified instructor will work with the children on a one-to-one basis as well as with the group. The structure of the curriculum is designed to reinforce important skills of confidence, individual empowerment, balance and a challenge for great personal success. The instructor must have previous knowledge of adventure programming. Currently the course has 3 zip lines, a 30 ft. high wire, 8 ft. low wire burma, a cargo net climb with zip platform, Jacobs Ladder, trolley trains, trust fall platforms, balance beams, 40 ft. ladder, Multi-Vine, firecracker ladder, Foxtails, vertical climbing pen, hanging knot rope climb, Duo-Dangle, Banana’s Bridge, Islands in the Sky and the Circuit. Although currently there is no national or state certification to instruct Project Soar, PFDC Inc. requires extensive knowledge of belaying, climbing equipment, ropes and knots. Proof of background is required (Outward Bound, Project Adventure, military). Hired applicants are encouraged to acquire professional development in addition to pre-camp training, for which PFDC Inc. will provide tuition supplements to interested candidates. Creative arts & crafts are part of the daily activities where campers can relax out of the summer heat and sun. The instructor should be an imaginative, experienced person who inspires fascinating projects such as collage, printing, sculpture, painting, tie-dye, candle making, puppets, masks, and multi-media projects for co-ed campers. The program is designed so children do not repeat projects from session to session. It is also a quiet time inside where dexterity and creativity are encouraged. This position includes organizing projects and materials for each day of camp. The instructor will be responsible for making samples of the projects and having all the materials ready for each class. We are looking for a creative talented person who can contribute new and exciting projects to the curriculum for all ages. Previous experience with children is required. This class must be planned with a weekly schedule. A project materials list must be completed and submitted to the office by June 1st for review. The art program has extensive supplies, many of which are recycled materials. It is up to the art staff to find creative ways of using these materials. You must have a current CPR & First Aid certificate. Each certified WSI, with the assistance of instructor aids, works with a small unit of the color group that are separated by swim levels. For our camp, the classes are arranged from Level 1 through Level 6, under the Red Cross standards. The instructor encourages a happy and safe environment for those learning to swim. This person must be an experienced instructor who has taught children ages 4-12. Swimming operates out of our 30’ x 60’ heated, 4 lane lap pool with diving board. The lap pool includes dive blocks and a shallow end with extended steps for instructing our younger campers. The pool staff is also responsible for cleaning the pool prior to each day of camp and the pool chemical readings three times a day. All applicants must presently hold a WSI and/or Certified Lifeguard card and be registered with the American Red Cross or show proof of enrollment in a class that will complete your certification prior to the commencement of camp in June. Please attach a copy to your application. Any applicant who needs recertification or new certification and is unable to find a course, should call the camp office for assistance. All certifications must be current to contract with PFDC. Requirements are the applicant is a minimum of 16 years old, has a CPR certification, and has successfully completed a minimum of level 6 Red Cross swimming lessons. Additional lifeguard certification is an advantage but not a requirement. The duties will strictly be to aid the instructors in the morning lessons. This is an ideal opportunity for any young adult who wants to become a full, swimming staff member or for those persons unable to commit to the entire 8 weeks of employment. Although general camp staff is scheduled from 8:00- 3:45, the riding staff follows a separate work schedule. This schedule is provided the first day of staff training. Be prepared for a 7:00am arrival several times throughout each session, as well as a Saturday and Sunday feeding schedule. No matter what your hierarchy is within the riding staff, all riding employees are required to complete morning feedings and two weekends throughout the summer. The riding program includes different levels of instruction depending on the campers riding ability. The instructor will provide a safe program to progress the child through the two weeks of their session. Pompositticut provides riding for our 2 & 4 weeks campers every day, on an individual basis. The individual time for each camper is short but it is definitely the safest way to instruct young children. During riding, campers work on a one-to-one basis with the instructor who provides not only individual attention but encouragement for first time riders. The rest of the group will work closely with the care and management instructor while waiting for their lesson time. You will be responsible for documenting each rider’s daily progress as well as completing a progress chart for each camper at the end of every two week session. LICENSED RIDING INSTRUCTORS: PFDC accepts many different qualifications and certifications for employment consideration. Please attach photocopies of your licenses and credentials to your application. COMPETITIVE AMATEUR RIDERS: Do not assume you cannot apply for an “instructor” position working with children and horses. You cannot acquire a license because you will lose your amateur status but all our riding staff work under the direct supervision of licensed instructors as well as the Director of Riding. Our summer schedule can cater to your competition schedule and allow you to train in the process! The main responsibility of this job is to make sure the riding program for the day camp is running smoothly and efficiently, which means being a liaison between the ring, the care & management station and the Director of Riding. This position requires a lot of vigilance over the preceding three areas to foresee potential problems and addressing them to increase the program’s efficiency. This Coordinator will work closely with the Director of Riding to create a fun and interesting riding program for the day camp. This will mean making quick decisions to minimize crisis situations, organizing programs and peacemaking between campers. The job will require a positive attitude to encourage and inspire other riding staff to enjoy their jobs and put in 110% energy into the campers while in their care. This person should have experience working with children ages 4-12 years old. The coordinator is responsible for teaching the children care and management of the ponies. You will be responsible for teaching 8-10 children at a time. A great deal of patience is needed for this position as the children are often excited to get to the ring for their riding lesson. A progression is followed from the most basic steps such as just patting the ponies with 4 year olds to making them more comfortable with the ponies, to teaching basic veterinary care to the 12 year olds. Topics covered are brushing, saddling, bridling, feeding, bandaging, parts of the horses, breeds, colors, parts of the saddle, parts of the bridle, stall cleaning and more. The care and management section is both “hands-on” as well as “classroom” style lessons. The coordinator reports to both the Operations Manager and Day Camp Supervisor. All riding staff must work well as a team. This position is the organizer of the ponies and horses used for the riding program. Extensive knowledge of handling and grooming is a must with a strong sense of time management and organization. The Barn Manager is responsible for delegating duties which include feeding, grooming, tacking up and putting away the ponies after lessons are completed. The Barn Manager has little contact with campers and is primarily accountable for the completion of the barn chores. He/she will be provided with at least 2 assistants and will be responsible for the scheduling of employees for additional hours during the work week as all horses and ponies need to be fed by 8:00am. The Barn Manager also has direct interaction with our Jr. Wrangler participants and will be required to instruct them throughout their workday with a hands-on approach, emphasizing safety and strong horsemanship, care and management skills. The primary responsibility of this position is the safety of our riders. Along with this, he/she will be an assistant to the Riding Instructors and the Care & Management Instructor and for checking boots and helmets to assure they are properly fitted and children are ready to ride at their scheduled time. This person’s major responsibility is the organization of the riding equipment and the helmets. The assistant is the organizer and peacemaker of allotted riding times of the campers. Knowledge of riding is important, as some handling of the ponies is required if the Riding Instructor is in need of assistance. This is a great opportunity to work closely with licensed instructors and to further your knowledge of teaching skills and working with children. The director of the Jr. Wrangler program is responsible for organizing a maximum of 6 teen participants that includes lessons in barn management, horse care, and instructing children. The Jr. Wranglers spend time working with licensed instructors and will need guidance when caring for and tacking up the horses. This position requires the ability to multi-task and be aware of what all Jr. Wranglers are doing at all times. The Jr. Wrangler program must accommodate the skills and interests of the teen Wranglers and the Director of this program must be able to seize any “teachable moment”. The Coordinator of this program is responsible for insuring the riders’ time at Pompositticut is fun, interesting, challenging, and most importantly safe! Each day should be planned out with activities and lessons varying in topics (see list below of topics typically covered). The session is limited to an intimate enrollment to provide increased individual attention as well as a specifically tailored program for the needs of the children. Each rider comes from a different background and skill level, and the lessons are based on these skill levels. The morning lesson should be organized to focus on each rider’s individual abilities and should challenge all participants. The afternoon lesson offers another opportunity to ride, this time in a more relaxed, clinic-style riding lesson on varying topics. Also, within the course of the day there is an un-mounted, classroom style lesson on any horse-related topic. Each session there are a number of visiting professionals who will need your assistance to create a lesson for the children, and to keep them engaged. It is the job of the Coordinator to keep the children enthusiastic and challenged by all lessons. At the end of every session there is a performance by the riders for the parents to watch their child’s progress made throughout the two weeks. The Coordinator is responsible for making sure the horses are well-cared for by the participants and that the equipment is maintained and well handled. This position requires extensive knowledge of horses, horse care, and riding. The Coordinator must work closely with the Operations Manager as well as with the other Heels Down Instructor. This is a very hands-on, involved job, with rewarding results. The job of the HD Instructor is to work with the HD Program Coordinator to provide the riders with daily support, knowledge, and a safe and enjoyable experience at Pompositticut. Although the riders vary in ability, all participants who come to HD should be proficient at riding and are walking and trotting independently. The instructor is to help the riders along with tacking up and assisting them while handling the horses. The group will be split up for riding and will be in 2 different rings, one taught by the HD director and the other taught by the HD instructor. The children should be challenged to try new skills and to be open to all disciplines of the equestrian world. The HD Instructor will be under the supervision of the Riding Director and HD Coordinator, and should be a flexible team-player. This position does not require an instructor’s license as you will be under the supervision of only licensed instructors. There is a requirement of either a minimum of 3 years teaching mounted, group-style lessons, or documented equestrian experience that meets Pompositticut’s quality standards. The pay scale is based on your commitment to the summer programming. Those persons agreeing to work the entire 8 weeks along with the 3 pre-camp days will base their pay on the 9 weeks scale. Other employees committing to less than 9 weeks will be paid according to the 6 weeks pay scale. Please note that your actual pay is determined by experience, past years on staff and special certifications. Remember to use the scale on the last page as a base only. If you are looking for a traditional sports program you will be surprised by what this activity is all about! Staff will concentrate on involving campers of all ages to increase their exercise levels in fun and fulfilling ways. Keep in mind, activities for Game On should differ according to the camper age groups and skill level. No more sitting on the bench, this is a real life video game that will have the group running and laughing while playing some of their favorite games in unconventional ways. Anyone for a game of Quidditch? How about Frisbee Bowling? Campers will be surprised by the variety of choices from which they can choose for their daily activity, all under the guise of FUN. It’s never too hot when there is water cannon target practice! You’ll keep the exercise stress free with non-competitive rules. It’s like the days of neighborhood hide n’seek when everyone joined in and you made up the rules as you went along. What freedom for creativity that everyone will be able to enjoy!! With the worldwide emphasis of saving our environment and the general awareness of the importance of our relationship between man and nature, the director of this program has the chance to truly teach and influence our future generations. Wildlife, geography, weather, gardening, and ecosystems, are but a few areas that could be covered in this program. In the past, campers have participated in: scavenger hunts, hiking, nature walks, geocaching, fishing, compass activities, bird watching and more. Included in this activity is a vegetable/herb garden in which the campers are involved in the planting, maintenance and harvesting of the crops. Successful crops have included: lettuce, peas, beans, tomatoes, peppers, broccoli, swiss chard, basil, parsley, and rosemary. Teaching experience and a strong knowledge of the outdoors is required for instructing this activity. Additionally, First Aid certification is preferred, as the groups are encouraged to explore the camp’s grounds. Knowledge of plants and poison ivy is imperative and must be taught to all campers. Although art projects may be planned, they must be strictly nature oriented. Projects in the past included rain sticks, wave bottles, pine cone wreaths, dried flower arrangements and spice balls. Due to the high number of returning campers, it is important the instructor brings new and exciting ideas to this program. The Archery instructor must be knowledgeable and appropriately skilled in the sport of archery. Basic archery skills will be taught to campers ages 6 -12, with appropriately sized bows and arrows for these age groups. It is imperative safety be the first concern of the instructor. He/she must be able to demonstrate the mechanics of archery as well as verbally explain the techniques involved in learning the skill. The instructor must be confident in his/her ability to safely, accurately and consistently hit the target. Knowledge of the parts of the bow and the care and maintenance of them is also imperative. This includes proper stringing and handling of the bows, along with daily checks of the equipment. Care is given to the proper protection of each camper using finger tabs, archery gloves and arm guards. Keeping the campers interested, challenged and attentive to the sport, is the major goal of the instructor. In addition to pre-camp training, you will be required to attend an archery certification course and/or provide proof of current certification. The Theatre-Dance-Music program is seeking a versatile individual to design and create programs that will cater to the varied age groups and talents of campers, ages 4-12. This instructor will incorporate new dances, songs, and/or skits, depending on the group’s interest, every two weeks for a closing ceremony performance. Creativity, flexibility, self-motivation, and the ability to handle several tasks at one time are the qualities sought in this instructor. Having a degree or background in dance, theater arts and/or music along with musical talents such as guitar, harmonica, piano or singing would also be beneficial. This position will focus on capturing both posed and candid digital photos of all activities throughout the summer which includes campers, Jr. Leaders, Jr. Wranglers and staff. Videotaping camper performances and creating completed CD’s for distribution is also required. Working under the pressure of a deadline and the ability to problem solve independently are necessary qualities for this position, as camper packets must be assembled for distribution every two weeks. Any knowledge of Adobe and Photoshop, are necessary as well as PC skills. This position can be coupled with another camp position, such as swimming instructor or riding instructor, where photos would be taken in the afternoon hours. Pompositticut Farm Day Camp, Metro-west’s premier Equestrian and Ropes Adventure Camp, with the longest and fastest zip line in the area, is seeking a new team member to manage all aspects of the camp website and daily social networking. The position would involve creating and designing print and targeted marketing communications to promote the value of the various camp programs. Included, is writing and editing camp features for print and online distribution. You will be providing excellent customer service and support by supplying timely information to campers, teens, staff and the general public. The candidate should possess demonstrated initiative, originality and command of English grammar. Important is the ability to interact and relate well with people of all ages in-person, on the telephone, in writing and electronically. Camp knowledge and/or experience are preferable. This person must have had 2 years experience working at PFDC Inc. as a Jr. Leader or staff member. The Administrative Assistant is a direct assistant to all the professional staff but mostly the Assistant Director and the Jr. Leader Director. He/she must be an organized, motivated individual who is not afraid to do whatever it takes to get the job done on a moments notice. Changes in the daily routine are likely to occur, so the applicant must be flexible and challenged by the variety of expectations required. Computer experience with knowledge of Microsoft Excel & Microsoft Word is necessary. The daily chores consist of, but are not limited to, the organization of the main headquarters building, selling soda, lunch distribution and overseeing the up-keep of all camp facilities. Put on your running shoes; you’ll need them to keep up! Any applicant for this position should be at least 16 years old. Unlike every other position at PFDC Inc. the operations manager need not always be present during the hours of the program. Flexible hours may be granted. This job also may commence weeks before camp. Any college student majoring in Agriculture, Farming, Landscaping, etc. would be ideal. PFDC Inc. has also been a training/intern employment opportunity for credit at several recognized universities. This should be discussed with your school and the director if interested. As a working farm, the operations manager could have any or all of the following skills: painting, scraping, fence repair, hydraulic post hole digging, landscaping, operations of Ford 1500, Kubato tractors, Green Machine lawn mowers, haying equipment, tedders and balers, light carpentry and operation of power tools as well as just a true desire to work outdoors. A self-starter and reliable person is a must for this position. Pay is based solely on experience. Therefore the pay chart does not apply to this position. Please note that your actual pay is determined by length of summer employment, experience, past years on staff and special certifications. Pay levels are indicated below with hourly rates determined at time of interview and signing of contract.